Full scope design of a smart home with an innovative schematic design for a young family. We took this apartment from a 70's wallpaper nightmare to a modern home. From custom window seats, built ins, closets and trimwork to selection of all material and furnishing, we made this modern home warm and personal using color, art and accessories. High end appliances, plumbing fixtures and storage galore gave the family room to grow. Photography by Andrii Zhulidov. We created a new lighting plan, adding a combination of perimeter recessed lights and chandelier lighting to make the house brighter and well lit. Architectural elements like custom trim and soffits take the eye upto the ceiling and make it an instant design feature. The great room includes the living room, dining room and multipurpose room creating open floorplan with each space centered around ceiling light fixtures. The deep blue leather sectional grounds the living room, while the upholstered chairs add a touch of softness and luxury. 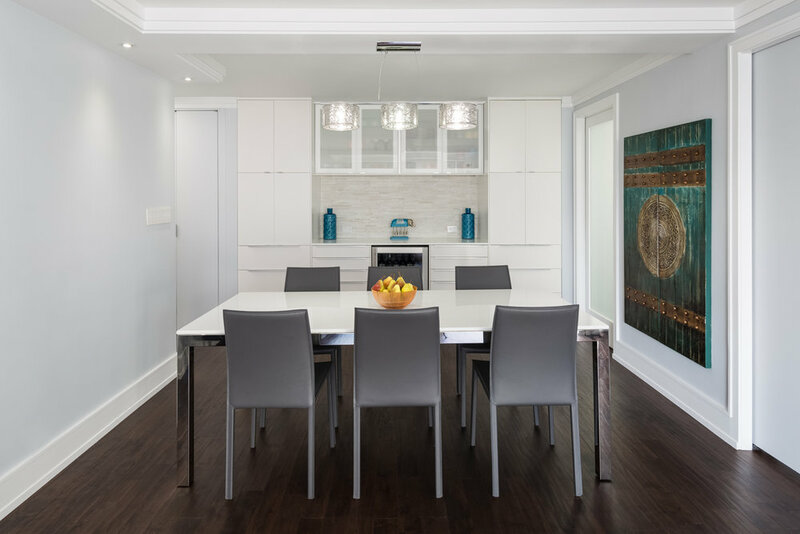 The dining room is anchored by the linear light fixtures and the beautiful quartz dining table top. The leather dining chairs add sophisticated minimalism in line with the rest of the design and the green artwork adds warmth and draws the eye in as people walk into the room. Custom built-ins around a white glass counter top and wine fridge create the perfect buffet to set up the bar or coffee station. The flat panel mill work becomes a neutral background while the marble chiseled tile adds much needed texture to this room. The multipurpose room is an extension of the living room with the overall color palette of grey, blue, silver and white. The room also is a music room for the violinists in the family (unfortunately not pictured here), a guest room for when family visits (this daybed opens into a king sized bed), mom's office everyday (shown in next pic) and the perfect spot for reading or watching the snowflakes dance. The custom window seat cushion has minimal banquette-like style in faux leather for easy maintenance. The custom grille hides the unsightly air conditioner which we were not allowed to touch by the building. We designed a custom niche for the desk and created additional storage in the room. 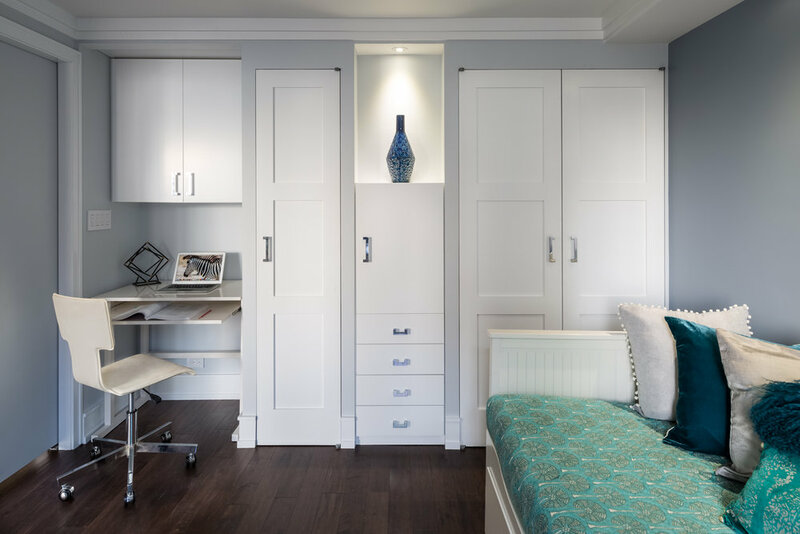 The pocket doors provide much needed privacy when needed to the room which otherwise is intended to be mostly open. These closets hide the pipes in the middle and we designed a spotlight to highlight the niche. We live for such design solutions!! The master bedroom color palette is neutral gray and white accented with blue bedding and artwork, very easy to swap if desired. A full length mirror bounces off the natural light from the windows on the opposite wall. This bedroom is a textural dream with the cowhide on the nightstands, leather and nail head trim, velvet headboard, quilted bedding and the softness from the flowers! Planned layers are critical to making a room come together. We loved designing and styling this room. 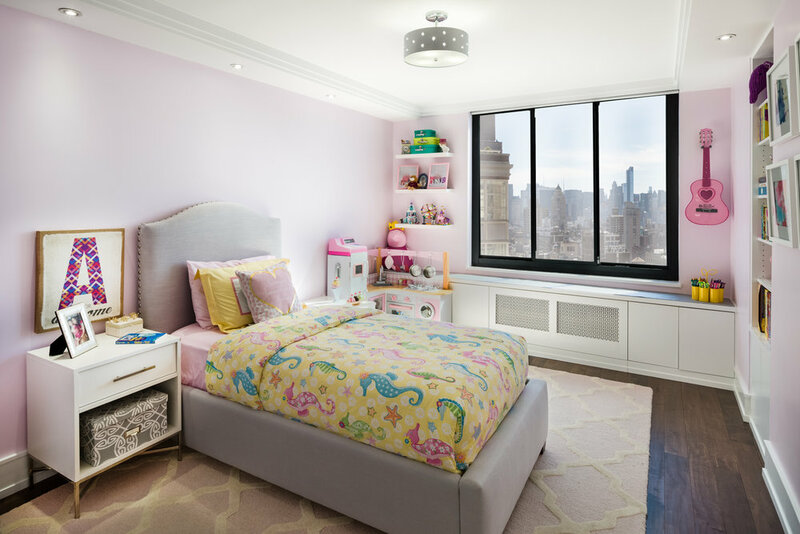 We designed the kids room with pink walls that don't offend and a big girl bed with plenty of room to add a desk and with a built-in for toys and games. 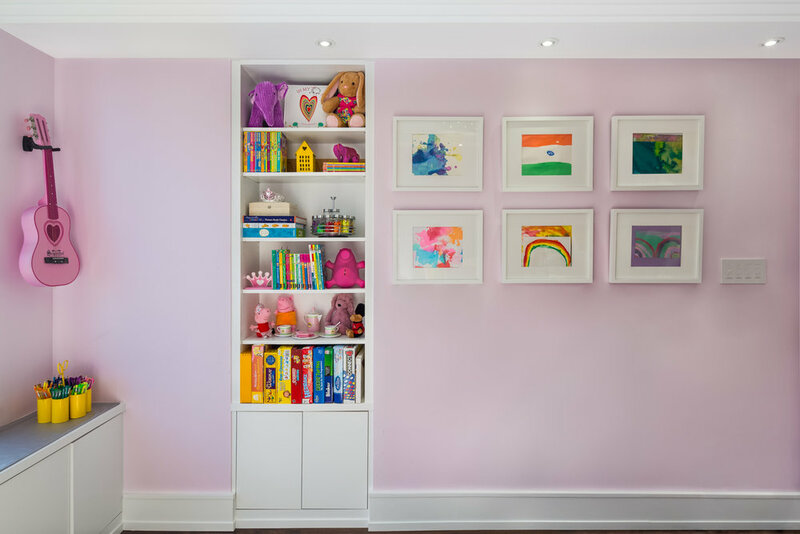 The feature wall with the floating shelves provide enough space to display art work and creations by the young creator. Facing the bed is the gallery wall showing artwork made by the budding artist. This of course is a rotating gallery space which can be easily updated. We designed a built in a bookcase with both open and closed storage for books, games and clutter. A peak into the living room, dining room, kitchen and the multipurpose room from the foyer. We love the open layout of the house and the flow it creates from one space to the other... there is clear definintion of space alongside open floorplan to keep everyone connected.